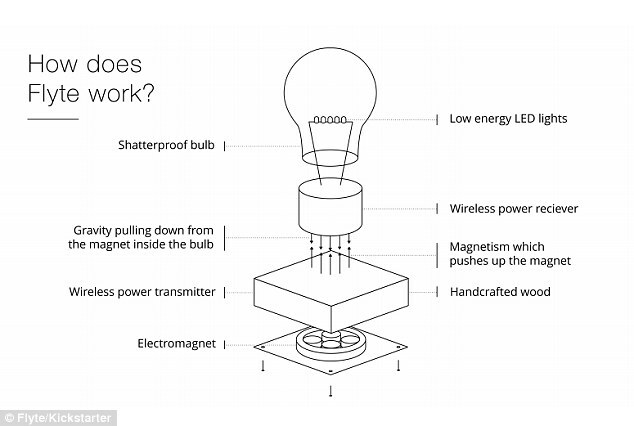 Home/What is?/What is Levitation Bulb and how it works? The Levitation Bulb is a gravity-defying lightbulb which will hang in the air. The lifespan of the bulb was estimated as 22 years if it works 6 hours a day and 11 years if it works for 12 hours a day. The Flyte levitating light bulb cleverly uses magnets to float in the air and hovers above a wooden base. It is a wireless device charging from the wooden base. The wooden base having magnets in it and draws power to the bulb floating over the base with the help of a charging block. The wireless power transfer is done using the induction principle. The levitation can be achieved by placing the bulb at the center of the wooden base. The Flyte bulb can be turned ON/OFF by tapping the wooden base. How does the FLYTE Works? Flyte levitate using the magnetic levitation technique. A magnet is fixed at the bottom of the wooden base and at the base cap of the bulb. Which tends to suspend the bulb in the air by opposing force from the wooden base. The wooden block should be plugged into a power source to levitate the FLYTE and to transfer the current wirelessly. This device can also be used as a wireless mobile charger. The FLYTE having a maximum brightness of 60 luminous. Which is much lower than the 450 lumens given off by a standard 40W bulb.